1. Recreate a master painting. 2. Create your own painting based on what you learned from the master. The second part of the assignment was a lot trickier. 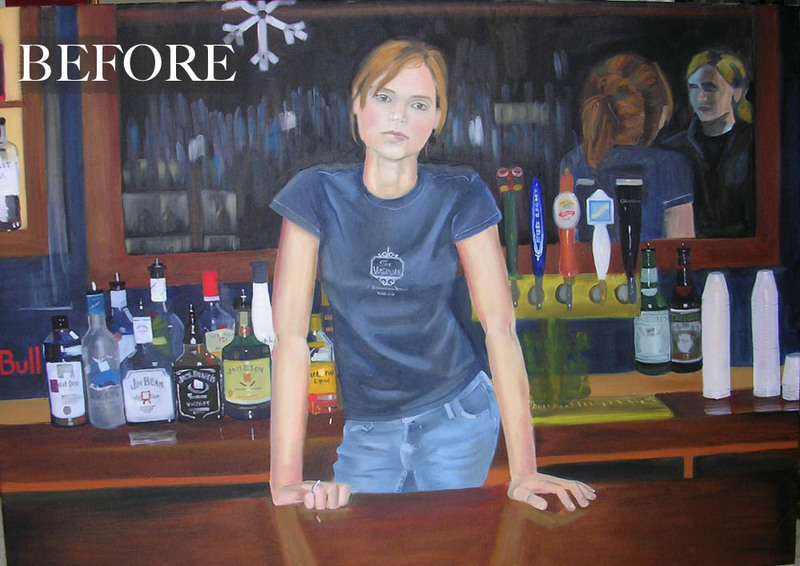 I decided to imitate Manet's style and composition, but replace the bartender (and bar) with a modern vignette that all UVa students know and love: the bar at the Virginian. I got a tired redheaded bartender to give me a similar pose to the one Suzon made famous in 1882. Anyway, I took the photos for the Virginian painting right before Christmas (AKA during finals) and photographed using FLASH - duh, that was a huge no-no. It looks terrible when you try to paint a person with flash lighting on them. It's so fake. ICK! I can't tell you how much I hate putting this on the Internet, seven years after I originally painted it. Let's begin to count the problems with this, shall we? You can tell I did this in a night or two. Lots of mistakes. This poor painting lives at my parents' house, unframed, propped in the basement. It needed its chance to shine! So I finally took a paintbrush to it while I was home over the holidays. I didn't have any of my original source photos, so I sort of made up a face, and got my mom to model the arms… thanks, Mom! It's no Manet, but I like the assignment nonetheless! I still think the modern-day painting could use some objects in the foreground, and maybe more color near the top… but it's a heck of a lot better than it was before! That's the beauty of paint… it's so forgiving, and there's always room to improve.